For as many years as I can remember I have continued to research dog food and keep up on the latest nutritional information, always looking for the best food to give my poodles for a long, healthy, happy life. I am on a dog food recall notification list and I am always amazed and horrified how many dog foods are recalled and how often. I am thrilled to say, I have found a healthy dog food that has never had a recall in their history. I am so excited about this food, I have decided to promote it and join them as a Field Representative and help spread the word. I have all my poodles on it and I am so impressed with their health, vitality, coat and the fact that more of this food is digested so I have less waste to pick up. Because of the quality and complete nutrition this food provides, you feed them less and therefore it is necessary to figure price per pound and amount they need to be fed to calculate cost. All ingredients are human grade, NO by products, NO artificial color , NO artificial flavor, NO wheat, NO corn, NO Chemical Preservatives and the list goes on. Another fact about this company is their commitment to freshness. They do not sell their food in stores, thereby eliminating the middleman who may store it in warehouses for unknown amounts of time and making it more susceptible to contaminants. Instead Life's Abundance produces their food in small batches and ships it directly to you. I love this because no more special trips to buy dog food which saves gas and I don' t have to lug those heavy bags in and out of a cart. Life's Abundance was formulated by Dr. Jane Bicks, a holistic approach Veterinarian. Read her biography and see her dedication! Click on the link below and read all about Life's Abundance. Be sure to watch the videos and use the Pet Food Calculator to complete your research. After you have evaluated this dog food and the company, I'm sure you will want to try this food and you can order it there. I'm sure you agree, our companions deserve the best food that we can give them. If you are buying one of my Standard Poodle Puppies, they are all fed this wonderful food and the results are clearly visable both in their beautiful coats, bright eyes and vitality. 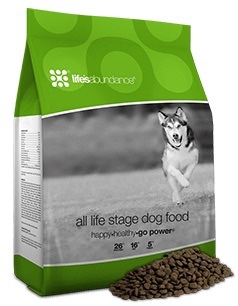 Life's Abundance Premium Health Food is formulated for both puppies and adults so there is no reason to feed a puppy food and then switch to a adult food. My puppies and adult poodles love the food and that makes me happy. With Life's Abundance, you can be confident that you are feeding your dog advanced nutrition. 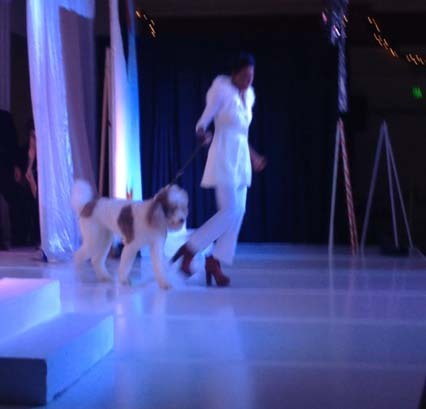 Life's Abundance has many other pet products, so be sure to check those out.